The Oscars of the power industry is now on its 10th year. Over a hundred executives and key industry players gathered yesterday for the awards night held at Shangri-la Hotel Kuala Lumpur. This year’s awards recognized the best projects in seventeen categories. Nominations were judged by John Yeap, Partner, Head of Energy – Asia at Pinsent Masons; John Goss, Managing Director of Ceejay International Ltd; and Andrew Bedford, Global Function Leader of KBC Advanced Technology Pte Ltd.
Sarawak Energy CEO Datuk Torstein Dale Sjøtveit bagged the coveted CEO of the Year award for his outstanding work in one of Malaysia’s leading power firms. “I am honoured to have been able to lead Sarawak Energy in this period of great transformation. We acknowledge that there is a lot more to be done and an even bigger responsibility that comes our way. This award is a much appreciated acknowledgement of our achievements so far and I’m sure it will drive us to greater heights,” he stated. Bronze - Solar Photovoltaic Commercial Rooftop Project powered by Thai Solar Energy Public Co., Ltd.
Gold – Jeneponto 1 powered by Indo Wind Power Holdings Pte. 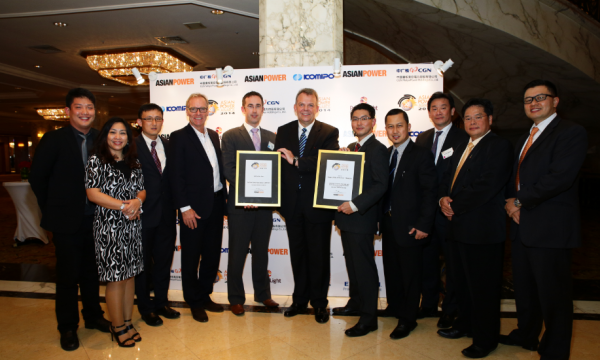 Ltd.
Gold - District Heat Conversion of KOWEPO Seoinchon GTCC powered by Korea Western Power Co,. Ltd.
Silver – Siemens’ "KOSPO Andong Combined Cycle Plant in South Korea"
Thai Solar Energy Public Co., Ltd.
Gold - CGN Meiya Power Holdings Co., Ltd.
Silver - Thai Solar Energy Public Co., Ltd.